Foot marks is one of the most common word used in Cricket especially in Test matches. The word Foot marks is used rarely in one day format. The complete package of concept of Foot Marks can be understood in Test Matches exclusively. SO WHAT ACTUALLY IS THE FOOT MARK ? The marks which are created by the Foot of a Bowler or Batsman on the pitch is called as FOOT MARK. How the Foot Marks are created by a Bowler or a Batsman ? Generally in any Kind of Bowling we have three categories. They are. A bowler runs and runs and gets in to the bowling action and then bowls a ball. After this scenario what ever the drama comes from the bowler is called as Follow Through. Follow Through is the last part of your bowling. Follow Through after the bowling action plays a major role in creating these Foot Marks. The bowler after his action at bowling crease, comes or runs little bit in front of the bowling crease by making Foot Marks at that place, there by completing the Follow Through. This scenario happens for every ball. Due to this continuous process by a bowlers, the Foot Marks are created for every ball in front of the bowling crease. 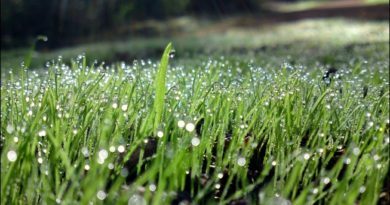 The Foot Marks which are created by every ball by bowlers gets denser or concentrated or close after continuous number of overs, then these concentrated Foot Marks will result you in the formation of Great Rough areas or spots. I think now you might got the complete idea of Foot Marks and Rough areas. These Rough areas or concentrated Foot Marks are mostly created by Fast bowlers. The reason is simple, these fast bowlers are more aggressive in their action compared to spin bowlers, as they bowl or Run from a long distance, their Run up will be strong, their bowling action will be strong and hence their Follow Through will be strong. As long as the Follow Through after the bowling action is strong the more the Foot Marks are formed. The spin bowlers also play a role in creating these Foot Marks but always fast bowlers play a major role. The complete package of concept of Foot Marks can be seen in Test Matches. In Test Matches generally we have 90 overs on a day and in a complete match we get 450 overs. On each day fast bowlers or medium pace bowlers bowl minimum 40 overs and this happens on each day of the match. At the end of day one you can see some Foot Marks in front of bowling crease. 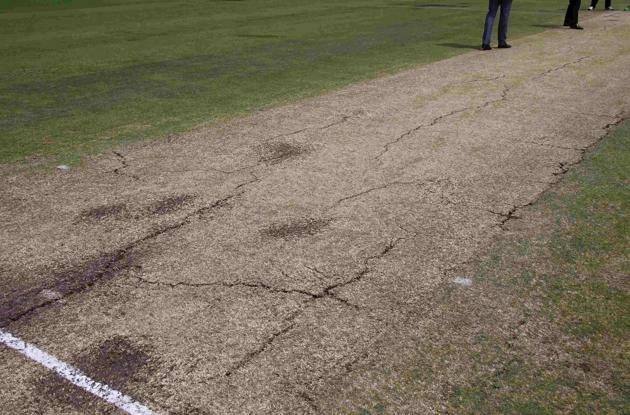 Now on second day of the match the same scenario happens and happens on the same pitch which already had some Foot Marks. At the end of day two you can see more concentrated or denser Foot Marks in front of bowling crease. Similarly at the end of day three you can see the complete package of Rough areas or densely concentrated Foot Marks in front of bowling crease. So due to continuous bowling from day one to day three on the same pitch with fast or medium pace bowlers bowling minimum 120 overs will result you in formation of Rough areas or concentrated Foot Marks. On day four and day five of the match you can see more real denser Rough areas in front of bowling crease. This process or scenario cannot be found in limited over matches like one days and 20-20 matches. So there is less scope of Rough areas concept in limited over matches. In cricket there is a thought that the Rough areas always support spin bowlers and helps them in bounce and turn. The spinning seam of the ball will nicely grips or contacts with this Rough areas, then the rotation of seam of the ball will take place so nicely, there by resulting in more turn and bounce, thanks to the Rough areas once again. As we know the genuine Rough areas are formed on third, fourth and fifth day of a Test match, thats why the spin bowlers always comes in to the party on these last three days of a Test match. We have to know that these Rough areas are formed in front of the bowling crease on either left side or right side of bowling end wickets. If a right arm bowler bowls, the Rough areas will form in front of the crease but on left side of the bowling end wickets. 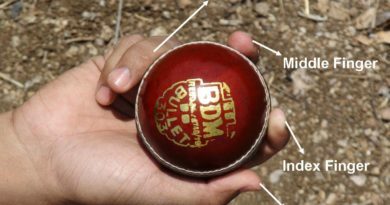 If a left arm bowler bowls, the Rough areas will form in front of the crease but on right side of the bowling end wickets. If there are Rough areas in front of the bowling crease on left side of the bowling end wickets, the leg spinners will be benefited mostly. Because if you look at from the other end or opposite end the Rough areas will be on out side the leg stump or leg stump line, therefore as we know, the leg spin bowlers always pitch their ball out side the leg stump line or only leg stump line, loves to bowl on those Rough areas which are out side the leg stump line. Similarly off spinners will be benefited if there are Rough areas on right side of the bowling end wickets. Similarly if you look at from the other end or opposite end the Rough areas will be on out side the off stump line, therefore as we know the off spin bowlers always pitch their ball out side the off stump line, loves to bowl on those Rough areas which are out side the off stump line. 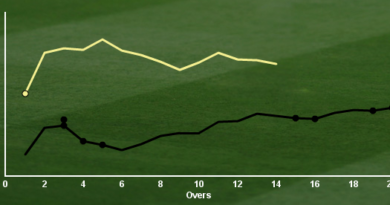 The formation of Foot Marks by a batsman will not be in a great extent when compared with bowlers. They often run between the wickets for runs, there is a chance for the formation of Foot Marks on the pitch, but they might form far from the middle of the pitch as the batsman always run far from the middle of the pitch between the wickets. Hence these Foot Marks may not be get used by spin bowlers. But the Foot Marks which are near to middle of the pitch will be used by bowlers. The batsman always moves from left to right in the crease after facing every ball. There is a chance for the formation of Foot Marks on those places where he walks, but these Foot Marks might not be denser or concentrated. Hence these Foot Marks may also not be get used by spin bowlers. The batsman often comes down the track on middle of the pitch, they often do walk on middle of the pitch, if most batsman does this drama there is a chance for the formation of Foot Marks on middle of the pitch. Hence these Foot Marks will be used by spin bowlers. What ever the concept of Foot Marks is discussed, can be seen genuinely in Test Matches.